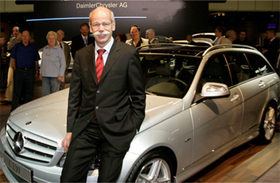 CEO Dieter Zetsche said Daimler will emerge stronger from the global downturn. STUTTGART -- Daimler today reported a disastrous fourth-quarter loss weighed down by significant losses and charges at Chrysler. Daimler swung to a loss before interest and tax (EBIT) of 1.95 billion euros ($2.47 billion) in the fourth quarter of 2008. Chrysler reduced 2008 group EBIT by 1.39 billion euros. Daimler has 19.9 percent equity stake in the U.S. carmaker. The loss did not include another 1.84 billion for the impairment of loans and other Chrysler-related assets. CEO Dieter Zetsche said the company would emerge stronger from the global downturn. "The Daimler group is in a relatively strong position to meet the crisis," he said at a press conference here to announce the company's 2008 earnings. Daimler said its 2008 profit before interest and tax fell from 8.7 billion euros in 2007 to 2.4 billion euros last year and predicted a tough year ahead as the global car sector faces up to the fallout from the world economic downturn. As a result of the downturn, Zetsche has called 2009 a "Darwinian year" for the auto industry. Daimler forecast group revenue would be likely lower in all of the vehicle divisions. "Futher substantial burdens are anticipated on the earnings of the group and its divisions," it said in a statement. "A more detailed statement on earnings will only be possible later in the year, when the development of the world economy and the automotive markets can be better assessed." Daimler warned that its car sales could drop another 10 percent in 2009 because of the financial crisis. Previously, Daimler had said sales at Mercedes-Benz Cars fell 2.3 percent to 1.26 million vehicles in 2008. Its heavy trucks business managed growth of nearly 1 percent to 472,100 vehicles. In its last public forecast upon releasing third-quarter results in October, Zetsche said only that markets deteriorated more than management had anticipated when asked whether Daimler had achieved its 2008 operating profit target of over 6 billion euros. Much like rival BMW, Mercedes-Benz benefited from debt-fuelled consumerism in markets like the United States where the company pushed volumes with attractively priced leasing deals that ended up costing Daimler nearly 450 million euros through the end of September. Adam Jonas, of Morgan Stanley Research, said Daimler burned through 40 million euros of cash per day during the fourth quarter, more than any other European automaker that has reported fourth-quarter results to date. Daimler ended 2008 with net cash of 3.1 billion euros, compared with 6.7 billion euros in 2007. "The question is not if Daimler loses money in 2009, but how much," Jonas said in a note to investors. Juergen Pieper, an analyst at Bankhaus Metzler, said: "The expectation that the car market is only declining by 10 percent this year is too optimistic. The great weak spots in 2009, in my view, are trucks and Mercedes."